The Nepal Olympic Committee (NOC) has honoured the men's paragliding team which won silver at last year's Asian Games in Jakarta and Palembang. Bimal Adhikari, Bijay Gautam, Sushil Gurung, Yukesh Gurung and Bishal Thapa combined to finish second in the team cross-country event in Indonesia. Their success was Nepal's only medal of the Games, with their achievement now recognised with a cash reward. They have each been given NPR20,000 (£135/$175/€155) for "bringing honour to the country". The Nepal Paragliding Association was also presented with an appreciation letter by the NOC, who honoured the team at their General Assembly in Kathmandu. 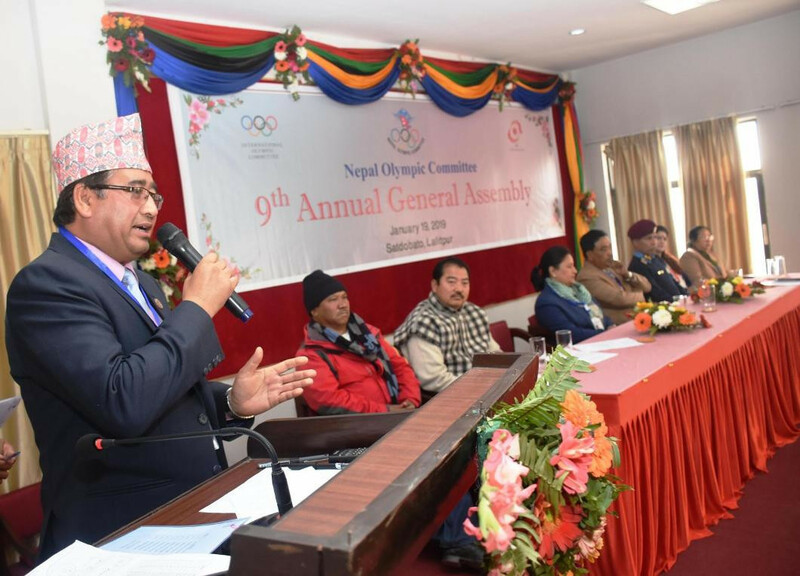 NOC President Jeevan Ram Shrestha ran the General Assembly while vice president Jyotoi Rana chaired the annual general meeting. Purendra Bikram Lakhe, another vice president, gave a welcome speech while Nepal Volleyball Federation President Maoranjan Sharma spoke on behalf of governing bodies. The National Sports Council was represented by Indira Niraula. The Women and Sports Commission of the NOC, the Sport for All Commission, the Medical Commission and the National Olympic Academy all made reports detailing their achievements and activities over the last three years. Deputy secretary general Rajiv Shrestha gave a presentation on the activities of the NOC, while treasurer Ratan Tandon revealed the provisional budget for 2019 which has been set at just under NPR42.4 million (£285,000/$370,000/€327,000). He then presented the audited reports of 2016 and 2017 which were passed by the General Assembly. Nepal will host the 2019 South Asian Games in Kathmandu.